I did a sketch for Andy Ihnatko. 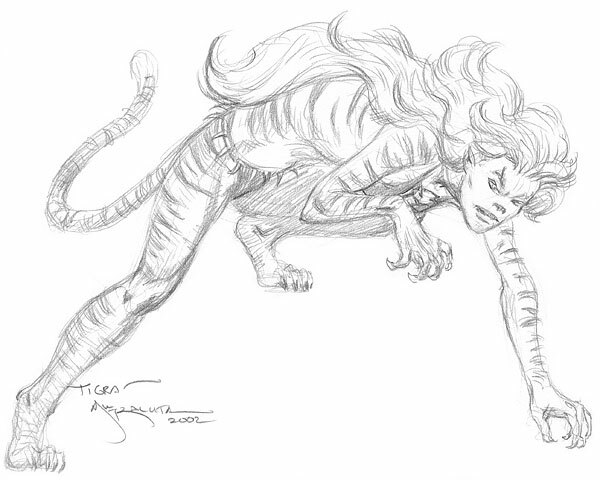 Here's what he has to say about it: "We met briefly back in June, at the Creators Con in Madison Square Garden, where you did a nice pencil sketch of Tigra for me. I liked your sketch so much that I sent it on to Bob McLeod to be inked. And then I liked your pencils and Bob's inks so much that I sent it to Tom Smith (The Avengers' regular colorist) to be colored....I've been collecting art for the part few years and almost from the start I've wanted to shepherd a piece from sketch to finished art. As soon as I picked up my commission I thought 'Now HERE is a sketch that demands the full treatment!' You really nailed the character."